ESL forum > Grammar and Linguistics > which is correct? I ´ve been away for a while and I ´m glad to see lots of you! I was wondering if someone might tell me which of these two expressions is all right. 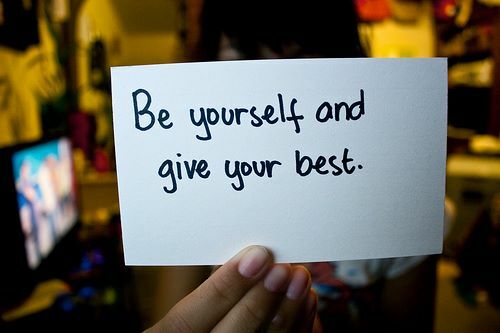 I ´m sure I ´ve heard many people say "GIVE YOUR BEST" meaning try to always give you best effort. But my collegues told this expression doesn ´t exist in English. They say that "DO YOUR BEST" is the correct way of saying it. Can somebody clarify this matter to me? I think DO YOUR BEST is more common in this case but GIVE YOUR BEST is also okay, especially when using GIVE IT YOUR BEST. Let ´s hear what others have to say. Do your best is the most common phrase. Give it your best shot = do the best you can. Give it all you ´ve got - (especially of physical effort) = put all the effort into it that you can. To add a little more, I ´d say that "give your best" - without "it" - would only be used in the sense of actually giving something (to charity, for example). I appreciate it a lot!!!!! !